— When Navy Commander Christopher Orwoll began planning a trip for his family to the Kansas Cosmosphere and Space Center in Hutchinson, he was intending to further his hobby. Instead, Orwoll discovered a new profession. 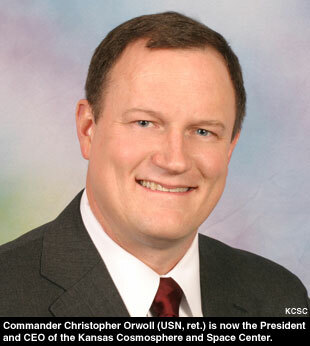 The former commanding officer of the Naval Reserve Officer Training Corps and professor of naval science at the University of Kansas, Orwoll was named the new president and CEO of the Cosmosphere last month after his predecessor, Jeff Ollenburger resigned in October. Ollenburger had held the position since 2002, replacing Cosmosphere co-founder Max Ary. Billed as having a U.S. space artifact collection second only to the National Air and Space Museum and the largest collection of Russian space artifacts outside of Moscow, the Kansas Cosmosphere gained international attention for its restoration of the Apollo 13 command module Odyssey and astronaut Gus Grissom's Liberty Bell 7 Mercury spacecraft. The latter was raised from the ocean floor where it had sat for nearly 40 years as part of an expedition co-led by the museum. Both spacecraft are now on display at the Cosmosphere. Orwoll, who previously served as the executive officer of the USS Dolphin, the world's deepest diving submarine, spoke with collectSPACE recently, after his first week at the Cosmosphere's helm. collectSPACE (cS): What led you to consider applying for the leadership of a space history museum? Chris Orwoll (CO): Part of that is easy, just the fact of where I grew up. I grew up in Downey, obviously with the connection there with North American Aviation / North American Rockwell. I can show you pictures of myself as a six year old shaking hands with astronauts who were there for their tours following their missions. So I have always kind of been a space nut, and have kind of done this as a hobby, shall we say over the last — however many years is that — quite a few while I have been serving in the Navy. 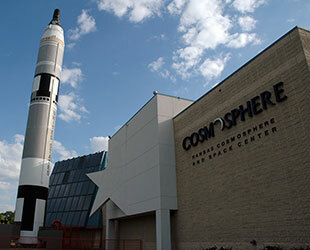 When I happened to start planning a trip for my family out to the Cosmosphere, I noted that the position here was open and kind of looked at it and said, "What better opportunity here with my background in the Navy, to maybe take a shot at working with the museum here and heading it up, combining, shall we say, hobby and leadership experience?" cS: How was your first week on the job? How have you found your transition? CO: The workload is pretty heavy right now because it's a lot of learning. I'm on a pretty steep learning curve right now, as you can well imagine, with my lack of background in the museum industry. That being said, a leadership position is a leadership position and the staff here is fantastic, so that part of it has been really easy. The volunteers here are a marvelous group of individuals and the paid staff is amazingly dedicated. So it's been a really easy transition coming out of the military thus far. cS: Have there been any surprises? CO: Really no, because I expected to be surprised every single morning. Like I said, its a learning curve. The joke, there is a saying in the military that you are being 'fed by the fire hose' right now. I am drinking from a fire hose as far as all the information I am trying to take in regards to operation of the museum, artifact preservation, collection, etc., and as these are areas I have not dealt with in the past. I'm having to get up to speed very quickly. cS: Have you inherited projects already underway and/or what are you focusing on next? CO: Some of the big projects that we have on-going, probably the biggest we have, is the work we are doing for the Evergreen Aviation Museum out in McMinnville, Oregon and that is proceeding at pace. We're on schedule for what we are going to be providing for them, all the exhibit structure for it. We're making little changes here and there, which are all based on which artifacts we can get ahold of, which ones they want, etc. In fact, we'll be going out to them for a meeting just in another couple of weeks to kind of finalize virtually everything. We are building the stands for the artifacts that we are going to be sending out there, simulators, etc. So, that is kind of one big thing that's on-going. In addition to that, we just purchased some land across the street, just closed on it last month. We used to have a small parking lot across the street. There used to be a building next to it. We now own that land as well. That opens up, shall we say, a whole plethora of possibilities. We are bandying about the ideas right now of taking our camp/educational facilities, the Future Astronaut Training Program and those sort of things and moving them all maybe across the street. That would open a ton of space up here for artifacts and exhibits in the museum that we haven't had available to us in the past. Over the next three to five months, we are going to be sitting down and really trying to focus on a strategic plan that is going to take us in the next one to five and 10 years. What's our focus going to be? How are we going to do this? We've got to start raising money if we are going to talk about building a building that size across the street. Those are kind of the dreams being bandied about right now, but nothing is set down on paper yet. cS: The Cosmosphere made a name for itself, in part due to its restoration services. Are there artifacts undergoing restoration at the museum now? CO: We've got a V-2 rocket right now that's sitting in our warehouse over on the other side of town. It's for one of the army bases we're restoring that. It's simple paint job for the most part; it's not a full restoration, it's a cosmetic restoration. And they've got a couple more rockets that they may want us to take a look at as well. We're doing some small restoration projects as well for the Evergreen museum, and that's just a piece we have had in our collection, the Mercury 10 capsule, that we're going to be sending out there. Other than that, nothing specific right now in our hands or that we're negotiating as we speak, but I think that's just a matter of time. cS: Much of the focus on the Cosmosphere over the past year has been in regards to the trial against one of your predecessors, Max Ary, for stealing and selling artifacts from the Cosmosphere. Do you feel you have inherited a burden as a result of that case? CO: I would say no, because I think the staff has really made a big effort to insure that everyone understood exactly what happened. I will say there were relationships that were made difficult over the whole incident with Max, but my job is to just come in here continue doing what is necessary to make sure that this museum succeeds. I really don't necessarily see that cloud is still "hanging over me" or the Cosmosphere, not as I see it right now, not as what I have seen after talking with folks. At this point in time, I see it as a kind of fresh slate. I come in here as someone totally independent of the prior process, so I have that as an advantage over what my immediate predecessor, Jeff Ollenburger, didn't have since he was here during the same time that Max was. I come in with a clean slate and that may make it easier in dealings with everybody whether that be other museums, the astronaut community, NASA, etc. That may make things simpler. Also, coming at it from the military, I don't come from a museum background but from a military background, so everybody knows what product they are getting. cS: At the heart of the Ary case was the disagreement over what belonged to the museum and what belonged to Max. Do you collect space memorabilia? CO: Yes I do, but more so I read books like crazy, so I have collected books and try to get autographed copies whenever possible. That's the area that I have collected. I married well — I married up — and my wife, her dad worked at North American Aviation and eventually North American Rockwell, and in fact my wife worked there for a period of time as well, so she inherited from her father a collection of space memorabilia, items flown in space, that sort of thing. So yes, by default, I became a space collector but it was not stuff I was really pursuing other than the collection of reading material. But yes, I have a collection. cS: Were there procedures in place as you took this job to draw the line between your personal collection and the Cosmosphere's? CO: The Cosmosphere's procedures are pretty strict on this one. What happens is, since taking this position, I have had to turn in to them an entire inventory list of everything that I have on hand coming into this position. And everybody on the staff has to do the exact same thing. And anytime you add anything to your collection, i.e. let's just say an astronaut comes through the Cosmosphere and signs a picture for me, I have to add that to my collection [inventory]. I buy a book, I have to add that to my collection. It's a simple electronic entry into it, that the vice president of museum operations, Jim Remar, he then sees. If it's something in his collection, then I have to see it. Everything else goes through him as he heads up the collections department. Then those records are kept down in our collections department. So there shouldn't be any issues as far as who owns what. It's all laid out from the very start. 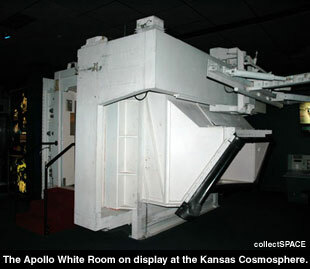 cS: The Cosmosphere is a Smithsonian affiliate. Have you spoken with the Smithsonian staff since joining the museum? CO: I have not personally, although we have set up a trip. I am heading back there in April to meet up with the Smithsonian affiliates, the Smithsonian itself, the Air and Space Museum, everybody that we normally converse with there. There's been no need for me as of yet to get on the phone with them because I am going to go out and meet them face to face in less than a month. cS: Let's talk a little about the Cosmosphere itself: you hadn't toured the museum until taking the position, right? CO: I had not. As I said, that's what introduced me to the whole fact that the job was even open was when I was scheduling a tour for my family. So I had not toured prior to coming here [for the position]. cS: Now that you've had a chance to see the collection on a daily basis, do you have a favorite item or display? I think probably, it's the Apollo 13 display, although right close to that is the White Room that we've got there with [Pad Leader] Guenter Wendt's signature, right above the point where the astronauts would have entered the actual space capsule. I think those two are favorites of mine. I think one of my favorite artifacts in the museum is the Surveyor III scoop, but its not on display right now. cS: If you could choose any artifact from any museum to add to the Cosmosphere's collection, what would it be? CO: I think a space shuttle but those aren't available yet. We're dreaming big here. cS: So you'd like the Cosmosphere to be house a retired orbiter? CO: Oh yeah, we'd love to. We know that it would require big changes here, but yes, we'd love to host one of the orbiters. cS: Finally, what's your major challenge to accomplishing the "big dreams" you have for the Cosmosphere? What's your biggest obstacle? CO: Nationwide draw, so it's location, location, location. No surprise here, it's been one of the issues since the very beginning, the location of this museum is not on a lot of people's radars who live on the coasts. Sadly, this is sometimes called "flyover country" because you fly over it as you go from coast to coast, so it's difficult to get as much draw as some of the other locations where there is more of a population center. That has always been a problem, overcoming that bias of "Kansas? Who the heck wants to go to Kansas?" I didn't necessarily think I ever did either until I moved up here and fell in love with it. So that is still and I think will always be our biggest problem. We're now thinking about how we can start approaching the markets a little bit more intensely on the populated coasts, especially for our education programs, the camps most specifically. Outside of the community that is interested in space, where there is at least some knowledge of the [museum], we want to try to get word out to other folks. They know about Kennedy, Johnson, Marshall, those sort of things, but the Cosmosphere? With the largest collection of U.S. and Soviet space stuff? In Kansas?